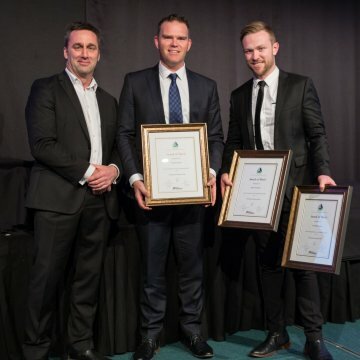 ENGEO celebrated being recognised with two Merit achievements at the 2017 ACENZ Innovate Awards of Excellence Gala Dinner, held in Taupo, New Zealand, on Saturday 12th August. This was the first year ENGEO entered the esteemed event, and the firm submitted two projects: Southern Response Global Consent and the Christchurch Adventure Park both received awards. The 2017 INNOVATE NZ awards are the premiere awards for projects in the professional engineering industry. Unique and highly regarded, the awards celebrate outstanding projects demonstrating a high level of technical expertise, innovation, complexity, and excellence in consulting work. The INNOVATE Awards differ from others as projects are evaluated individually on the merit of each project alone. Projects are evaluated by at least four judges who make up a panel of very experienced assessors. Frequently, winning projects help to introduce a new industry norm, which constantly challenges professionals to become better at consulting for clients and the public good. Over 300 people from around New Zealand attended the event. Southern Response Earthquake Recovery Services Ltd is the government-owned company responsible for settling claims by AMI policyholders for Canterbury earthquake damage which occurred before 5 April 2012. Arrow International (NZ) Ltd has been appointed as Southern Response’s agent to undertake damage assessments to AMI policyholders’ properties, scoping and cost estimating of the necessary repair / rebuild work, and the project management of subsequent construction works. A significant proportion of those houses were unwittingly built on contaminated sites. These included uncontrolled fill, former municipal landfills, horticultural land or land containing other localised contaminants (asbestos, lead paint etc.). Due to national legislation and our client’s stance, each residential property required an assessment to determine the extent and magnitude of soil contamination. To manage each of the site re-builds through the resource consenting process would have resulted in significant delay and expense to the project. Therefore, ENGEO assisted our client in receiving a global resource consent to streamline the process. Currently we have assessed over 400 residential properties, managed the remediation of over 100 asbestos-contaminated sites, and managed 85 sites through the resource consent process from application through contractor handover, works monitoring and ultimately to sign-off and council approval. The Christchurch Adventure Park (CAP) is a 900-acre outdoor adventure facility located in the Port Hills of Christchurch. 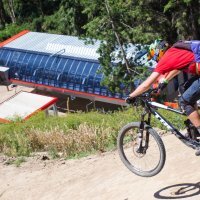 The CAP is the world’s first purpose built, chairlift accessed mountain bike facility and also includes four ziplines up to 1.1 km long and 186 m high. ENGEO worked on the project from April 2014 until opening in December 2016. The services included geotechnical engineering for buildings, chairlift and zipline foundations, rockfall hazard assessment, hydrological modelling and environmental monitoring. The construction period was originally intended to be 20 months, however owing to funding timeframes this was compressed into eight months. The tight timeframe meant ENGEO had to undertake investigations and design during the actual construction phase without impacting construction sequencing or quality. This was achieved through having close, collaborative client and contractor relationships, and by taking a highly pragmatic approach to all aspects of our work. CAP opened on time and within budget on 20 December 2016.